Cleaner Audi Q7 driven | What Car? New Audis are like the animals in Noah's Ark these days: they arrive two-by-two. About the same time as a revitalised TT range goes on sale, significant modifications to the Q7 are also being introduced. Audi's big SUV has never been the subtlest of cars, but beneath the brash exterior it wasn't the climate criminal some people believed. Now it's even less so. There are three new, more socially acceptable engines, while a fuel-saving eight-speed automatic transmission becomes standard. Unfortunately, there are no external changes to demonstrate this to the ill-informed. That trio of new engines is led by a 3.0-litre V6 TDI diesel producing the same power and torque as the similar unit it replaces, but with a 23% cut in fuel consumption and a 44g/km reduction in CO2 emissions, helped by an engine stop-start system a first in the UK for a V-engined car with an auto gearbox. There's also a 'clean' version that meets 2014 pollution-reduction targets, though at a price both financially and in increased CO2. Audi has boosted the torque and reduced the fuel consumption of the 4.2-litre V8 TDI, too. On the petrol side, the 3.6-litre V6 and 4.2-litre V8 TFSI engines are replaced by a couple of slightly less powerful, but more torquey, supercharged 3.0 V6s that bring economy improvements of up to 19% and cuts in CO2 of between 40g/km and 55g/km. On the evidence of the more powerful of the two, they're good, but no match for the diesel. Low-speed gearshifts aren't as seamless, and the gearbox has to kick down a ratio or two when you want to gather pace on the motorway, whereas the V6 TDI sails serenely on, aided by its vast swell of torque 407lb ft at only 1750rpm. If it wasn't for the lower rev limit and a mild tremor through the accelerator pedal, you'd have no idea it was a diesel. 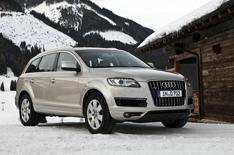 Brilliant new diesel boosts Q7's appeal.